LEFT: The Hotel Palacio del Retiro occupies an historically-protected mansion facing the Retiro Park. To our way of thinking, luxury hotels are most enjoyable when they offer a sense of place--and the kind of experience that you'd never be able to enjoy at home. Madrid's Hotel Palacio del Retiro is a perfect example: This 50-room boutique hotel occupies a palatial mansion that once belonged to the Oriol family and later served as the headquarters of the Talgo company. The early 20th Century building is lavishly decorated in a Spanish eclectic style, with stained-glass windows, stairwells, fountains, frescoes, molded plaster, marble and parquet floors, wood paneling, and other over-the-top design features. It even has a 100-year-old carpet, made by the Royal Tapestry Factory, that runs up a three-story staircase--all in one piece. Within the historically-protected mansion, the hotel owners have installed tasteful modern furnishings that complement the building's ornate interior decor. Accommodations range from single and double rooms (some facing the inner patio) to a Presidential Suite in the building's former library. The building itself is only one of the Hotel Palacio del Retiro's attractions: The hotel is located directly across the street from Jardines del Buen Retiro, a.k.a. the Retiro Park Gardens. 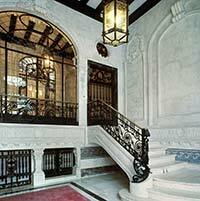 It's also within walking distance of the Prado, Reina Sofia, Thyssen Bornemisza, and Artes Decorativas museums. The Atocha railroad station is 1 km south of the hotel. In addition to comfortable rooms and an appealing location, the Hotel Palacio del Retiro has a first-rate restaurant, a bar, a spa and fitness center, and facilities for business travelers. For more information, visit the Hotel Palacio del Retiro Web pages at Booking.com.